1483365018 –Introduction to Teaching: Making a Difference in Student Learning, Second Edition is the ideal text for aspiring teachers. 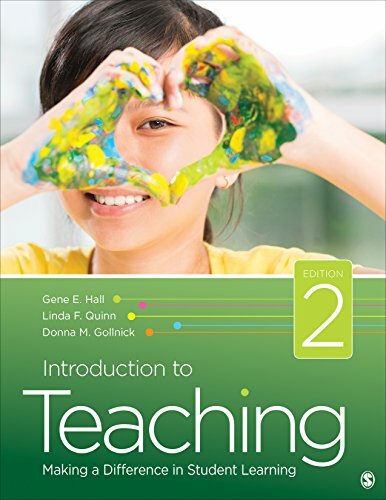 Acclaimed authors Gene Hall, Linda Quinn, and Donna Gollnick thoroughly prepare teacher education candidates to make a difference as teachers, presenting first-hand stories and evidence-based practices while offering a student-centered approach to learning. The authors target one of the biggest challenges facing many of today’s schools―making sure that all students are learning―and help teachers make student learning the primary focus in all that they do. From true-to-life challenges that teachers will face (high-stakes testing, student learning assessments, low teacher retention, Common Core Standards) to the inspiration and joy they will discover throughout their teaching careers, this text paints a realistic picture of the real life of a teacher.